Gauge: 16 sts and 16 rows = 4” (10cm) in sc. Insert hook in next st, yo, pull up a lp (2 lps on hook), insert hook in next st, yo, draw up a lp (3 lps on hook), yo, pull through all 3 lps on hook. With Surface Sl Sts, make sure that the yarn is always to the back of your work. Insert hook through work (where the start of the surface sl sts should be), pull up a lp, *insert hook into the next hole (this can be either the next st of the next row), pull up a lp, pull the first lp on hook through the 2nd lp; rep from * to desired length. 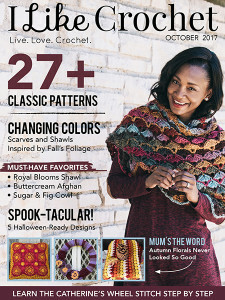 This poncho is worked in rows starting at the back and separating for the fronts. 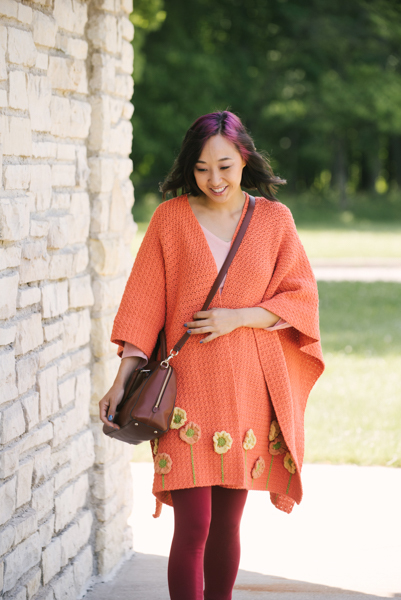 The poppies are worked in the round and sewn onto the poncho. With B, ch 157 (167). Row 1: Sc in 2nd ch from hook, dc in next st, *sc in next st, dc in next st; rep from * 76 (81) more times, turn – 156 (166) sts. Rows 2-106 (112): Ch 1, sc in same st, dc in next st, *sc in next st, dc in next st; rep from the * 76 (81) more times, turn – 156 (166) sts. Row 107 (113): Ch 1, sc in same st, dc in next st, *sc in next st, dc in next st; rep from the * 34 (36) more times, sc2tog, turn – 73 (77) sts. Row 108 (114): Ch 1, sc2tog, dc in next st, *sc in next st, dc in next st; rep from the * 34 (36) more times, turn – 72 (76) sts. Row 109 (115): Ch 1, sc in same st, dc in next st, *sc in next st, dc in next st; rep from the * 33 (35) more times, sc2tog, turn – 71 (75) sts. Row 110 (116): Ch 1, sc2tog, dc in next st, *sc in next st, dc in next st; rep from the * 33 (35) more times, turn – 70 (74) sts. Row 111 (117)-212 (224): Ch 1, sc in same st, dc in next st, *sc in next st, dc in next st; rep from the * 33 (35) more times, turn – 70 (74) sts. Attach yarn, skipping 8 (10) sts at the center. Row 107 (113): Ch 1, sc2tog, *sc in next st, dc in next st; rep from the * 35 (37) more times, turn – 73 (77) sts. Row 108 (114): Ch 1, sc in same st, dc in next st, *sc in next st, dc in next st; rep from the * 33 (35) more times, sc in next st, sc2tog, turn – 72 (76) sts. Row 109 (115): Ch 1, sc2tog, *sc in next st, dc in next st; rep from the * 34 (36) more times, turn – 71 (75) sts. Row 110 (116): Ch 1, sc in same st, dc in next st, *sc in next st, dc in next st; rep from the * 32 (34) more times, sc in next st, sc2tog, turn – 70 (74) sts. Note: Make 25 Poppies total following Color Pattern below. Rnd 1: Ch 1, 6 sc in ring, sl st in first sc of this rnd to join – 6 sts. Rnd 2: Ch 1, sc in same st, 2 sc in next st, *sc in next st, 2 sc in next st; rep from * once more, sl st in first sc of this rnd to join – 9 sts. Rnd 3: Ch 1, sc in same st, sc in next 8 sts, sl st in first sc of this rnd to join – 9 sts. Rnd 4: Ch 3, 6 dc in same st, *6 dc in next st; rep from * 7 more times, sl st in first dc of this rnd to join – 54 sts. Rnd 3: Work in C.
Rnd 4: Work in A. Working from the bottom of the Poncho (where indicated in diagram), make surface sl sts, working towards the top of the poncho. The line of surface sl sts should measure 2” / [5 cm] in length. Working from the bottom of the Poncho (where indicated in diagram), make surface sl sts, working towards the top of the poncho. The line of surface sl sts should measure 3.5” / [9 cm] in length. Working from the bottom of the Poncho (where indicated in diagram), make surface sl sts, working towards the top of the poncho. The line of surface sl sts should measure 5” / [13 cm] in length. 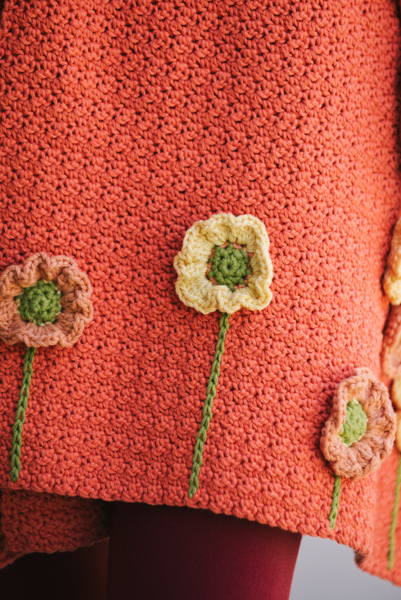 Arrange the poppies along the bottom of the Poncho (order shown on diagram), making sure to space them out evenly. Using tapestry needle, sew all the poppies into place. Weave in all ends. 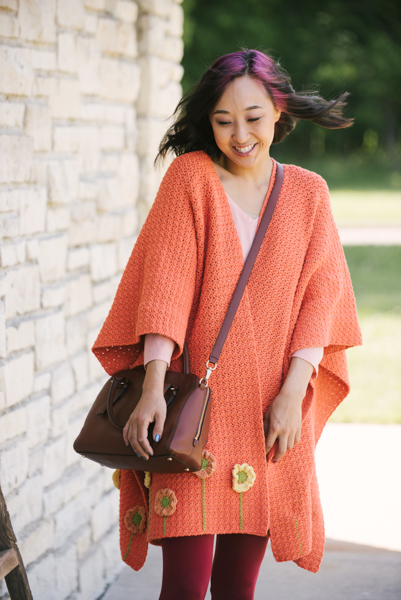 Block Poncho to measurements. I like this, but where is the “diagram” (for placement of poppies)?